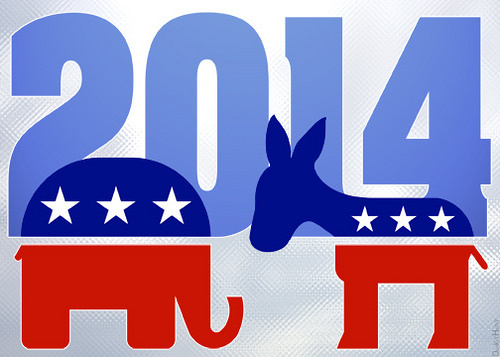 There are more than nine months to go before the 2014 U.S. midterm elections take place, but campaign season has already begun—and is about to hit full swing. All 435 seats in the U.S. House of Representatives will be contested, along with 33 of the 100 seats in the Senate, 38 governorships and many state and local positions. Per capita contributions in the Washington, D.C. are more than four times that of the Chicago metro. Boston contributes to Democrats at twice the rate of its Republican donations but the area is a top giver to both parties. 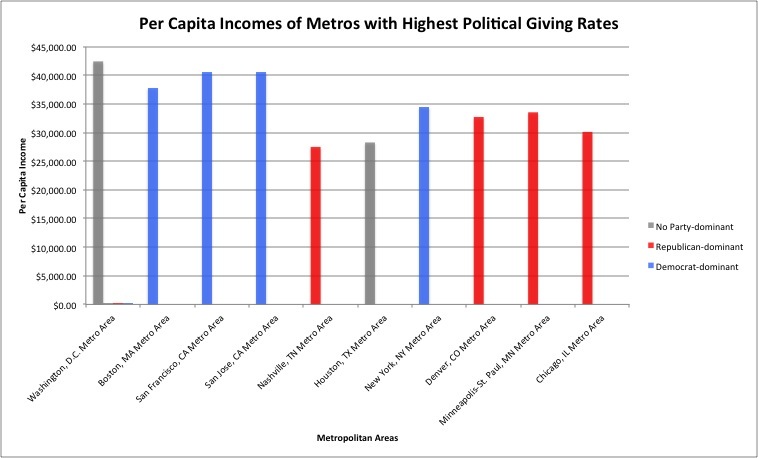 Nashville is the smallest metro among the places with the ten highest giving rates–its per capita rate is higher than larger metros such as New York and Chicago. The Houston area is the only place in Texas among the top ten. Two major California cities are hotbeds for political contributions, ranking in the top five overall: San Franisco and San Jose. It’s no surprise to see the nation’s capital at the top of the list with contributions totaling $51.1 million. The D.C. metro area’s per capita contribution of $8.81 is almost twice as high as the second highest place on this list. Of D.C.’s total contributions to the two major parties for the 2014 races, about 57% went to Democrats and 43% to Republicans. However, there were far more “no party” donations overall. Some of this year’s top overall donors in the nation are based here, such as the American Federation of State, County & Municipal Employees (AFSCME)—comprised of 3,400 local unions and donating exclusively to the Democratic Party and outside spending groups this season. 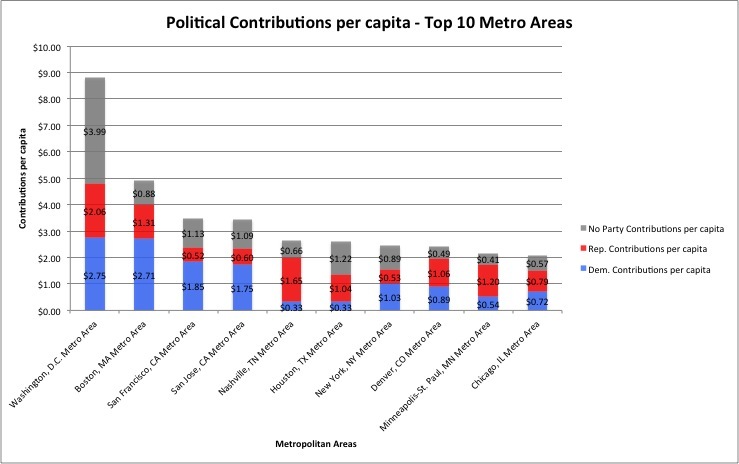 The Boston area’s political contribution rate of $4.90 per capita is the second highest of all metropolitan areas in the country. The Commonwealth of Massachusetts has historically been a politically liberal state, and Boston’s 2014 giving rates reflect this trend: nearly two-thirds of all contributions to parties went to Democratic candidates or groups. George and Lizbeth Krupp of Berkshire Group were the largest individual contributors from the Boston area—their $180,300 contribution, 100% of which went to Democrats, makes them the 21st largest individual giver in the nation. The predominantly liberal San Francisco area contributed $3.49 per capita to candidates in the 2014 election for a total contribution of $15.6 million. Of the donations that directly reached one of the two major parties, 78% went to Democrats—the highest left-wing ratio of all ten places on this list. One of the biggest political givers from San Francisco is Marc Benioff, CEO of Salesforce.com. Benioff and his wife Lynne have contributed $172,600 to this year’s elections, 82% of which went to Democrats, 16% to Republicans and 3% to others. Not too far behind the San Francisco area is San Jose. Similar to its California counterpart, the San Jose metro directed nearly 75% of all of its party-specific contributions towards Democrats. Falling under this area is Google, headquartered in Mountain View, CA. The multi-billion dollar company is the 30th biggest overall contributor this year, giving $993,778 to political parties, 60% of which went to Democrats. The Nashville metro is the smallest of all ten places in terms of overall population. However, its per capita political donation rate of $2.64 is fifth highest on this list because of the area’s overall contribution total of $4.3 million. A whopping 83% of Nashville’s part-specific contributions were given to Republicans, which is the highest such ratio of any of the highest contributing places. The greatest individual contributor in from the Nashville metro area is Willis Johnson, Founder and Chairman of publicly traded Copart, Inc. Johnson’s contributions total $146,500, 97% of which were given to Republicans. Interestingly, four of the top five per capita incomes belong to metropolitan areas that have contributed heavily to Democratic candidates—San Jose, San Francisco, Boston and New York. Of the five lowest per capita incomes, four belong to places that have seen Republican-dominant political contributions for the 2014 election year—Nashville, Chicago, Denver and Minneapolis. The Washington, D.C. area not only has the highest political giving rate in the country (by far), but it also has the highest income per capita of the top ten contributing places. All political contribution data was obtained from the Center for Responsive Politics.